Word around B.E.T. this afternoon is that MBCR will lease two of the five, 67 was put back in the line-up at 5:30 this evening. As in MBCR will lease them and charge the MBTA for a sublease on them? Or did you mean that the MBTA is extending the leases on two of them? This would be MBCR funding it, not the MBTA or MBCR billing the MBTA. If they are going to be around for awhile longer and the 59 & 67 werent too bad, I think it would be a good idea to just purchase them to own. The 67 was on 352 this morning; 1513 control cab, 5-car flat train. 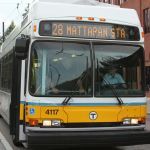 sery2831 wrote: This would be MBCR funding it, not the MBTA or MBCR billing the MBTA. What's the incentive for MBCR to lease them? To help keep trains on time to avoid paying fines? Or is it something else? Well the contract is up in less than 2 years. This shows that they want to work with the MBTA to keep service going, when MBCR has the means to and the MBTA does not. Rumored there are 3 being leased. Two are confirmed on trains today, the 59 and the 67. The third one is probably the 61. The third one is most likely the 61, its inside on Diesel 1 getting the once-over, the 51 and the 66 have just too many issues, and Chris, they appear to be replacing the patched-up number indicator. Oh good! It was starting to look really worn! When are the engines(51, 66) supposed to leave the property? The 59 was out tonight, and should be out tomorrow. Are the rejects getting scrapped or will they just sit at MPI? With all the work put into them, they will probably run somewhere.